you could sew on more cloth to the ends to act as some sort of weight? Can't wait to try too!!!!! that looks awesome! I think you could do something really cool with buttons or ties to close it shut, too. Like maybe shred the inside edges so you can tie them together? LOVE THIS! For the ladies, maybe you could use a vintage brooch to close it up? great idea! i have a plain white shirt that's just too big for me. x) i might just turn it into a cardy, too. I might try this. It looks simple enough. I've been trying to get into DIY clothing for a while, but I'm not so talented in that department. I might have to try that idea, I never thought of doing that before! i was thinking of doing this exact thing with a thriftstore sweater! i like the vest idea, though. 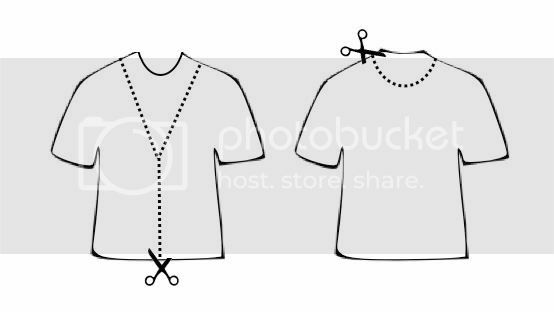 great idea.. i just can't decide what shirt to use.. kinda seems to hard of a choice..
and i have a million buttons in some box somewhere so i'll probably stitch them on. great idea! trying that this weekend. That looks really good!! I'm gunna have to try that sometime! good idea! that never would have occurred to me. ohoh, i am trying this. itd look pretty radical with a shirt with some design on the front.